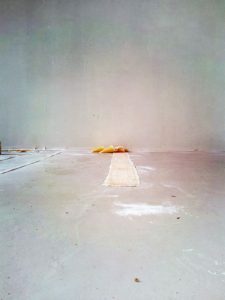 In connection to artistic work the discussion about prototypes points to material, technical or spatial experiments. In addition to that it also points to experimenting with time or deals with imaginary issues. In a test setup one can find out how a certain prototype artwork behaves and functions in specifically chosen surroundings. The experience gathered from this test setup is used to develop the next work in the next test setup. The altered work leads again to the next altered work and after that – comes nothing. This “nothing” means that artistic work and artistic research takes place mostly in this state of being a prototype. This kind of prototype must be, to my mind, breakable to its components and reassembled again and again. This makes it an on-going prototype. To reject a working setup and to build a new one from scratch is part of proceeding with the work. That means, that the development of the work and even the content of the work defines itself often only in the proceeding of the implementation of the work. The prototype discussed here is not heading towards production. Instead it already exists as a thing or as a situation. It is also not a typical example of its kind. It is something in a situation or in an object that is still unknown, something that is just about to develop. This ”something in development” is waiting for the moment to surface, as it is waiting to be thought of and to be worked into a piece of art. In this prototype setup the work functions like a ”frottage” of something that not yet exists. A frottage is bringing to the surface something that is hidden beneath it. Like a frottage the prototype is revealing itself in the action of making visible what is covered or hidden. The artwork origin is in the action of the making-visible. (Heidegger 1960/2003). Prototype thinking is turning upside down the timeline. An existing found situation provides clues in order to find out of which future situation it could be considered the starting point or prototype. In this setup the artwork reveals the prototypical potential of the all ready existing. The prototype introduced here has one particular feature. Namely it is to be found as a hidden quality in already existing situations and in already existing objects. It originates from something that already exists and is in use but we have not noticed it. It has an imminent potential feature directing to a different situation or to a different use than it has had until now. In artistic working the artist is testing for what kind of future situation this present situation could be a prototype. 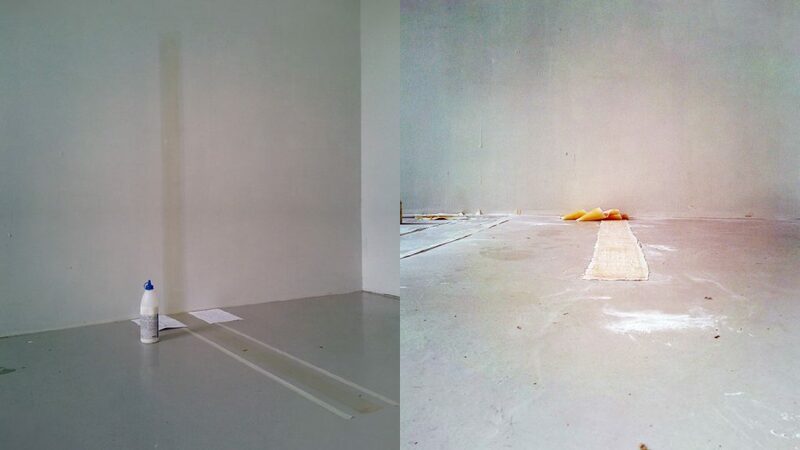 As an example I examine the prototype potential of a wall in a work called Wall and Floor. The work consists of latex. I got the idea to the work in my new still empty studio. 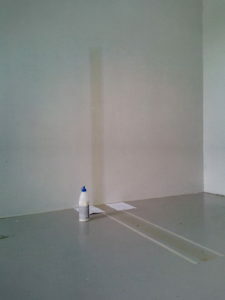 I made a vertical strip of latex onto the wall. It was about 150 cm high and 15 cm wide. The strip reached down to the floor and continued in a 90-degree angle on the floor into the room. The latex strip consisted of many painted layers of latex. Each layer was applied by a brush and it had to dry before the next one could be applied. The outcome was a rubbery strip half of which was sticking to the wall and half to the floor. As the latex strip reached a certain thickness, I pealed it off the wall and off the floor and then I rubbed the latex with talc so it would not anymore be sticky. The floor part of the strip was looking almost the same as before the pealing as it was laying on the floor. The wall part could not sustain itself. It was slumping. The reason for that was that latex is a passive material and it adapts to the conditions of the surroundings. The law of gravity let the latex strip rest on the floor. The same law forces the strip on the wall to slump. I held the latex strip with my hands up against the wall. I released it. I picked up the latex strip again and repeated the action. I wanted to depict the moment when the latex strip is slumping. If the wall itself was made out of another material it could have an alternative property than only to stand upright. It could possibly slump.